So i've been working with quartz composer for a few months now but never tried to use any of the templates until now. I looked at the music one at first and i didn't get it. Thru some google searching i figured out how to make it work and saw how cool it is. Now i understand that you need to use the certain audio protocol for the comp to pull the audio information and itunes has to be running. But is there a work around so you can have any song play and not have it run thru itunes. Hook the spectrums up to some object to make it move and dance with the audio?? For example, I use QC to create digital signage and on my shows i usually use a animated background. On one of my layouts the BG is just black and i have a video playing in the foreground and it has a sweet looking reflection. Well now my boss wants to have BG music. I figured out how to get that in by using the audio tools 0.8 from this site. But now i want to take it one step further and make a cool, psychedelic visual BG that will react and move with the BG music track. How can i do that without using the protocol and relying on itunes to play my song?? Danny_j, the iTunes music visualizer protocol is pretty strictly constrained to working only within an active iTunes visualizer window. You could always use Kineme Audio Tools, especially File Input and File Player. See this example from my site Peon Build Example files which is intended to be further incorporated into a Quartz Builder application, but is not iTunes visualizer protocolised and could easily take a multiplexer . One can use ./Media file path, very convenient for bundling into a dedicated project folder. The actual PeonBuild example files are instead using a root level file path. i just read they have lifted the security protocols in reference to QC and itunes so now video patches and custom plugins work as a visualzer conformance. SL has a 3d spatial open AL sound player that is pretty cool. kinemes stuff is great. i think if you get this program called sound flower (soon it will work with SL ) and use that its a virtual audio routing program meaning you can play itunes into qc without having to conform to protocol by using the regular audio input patch. basically you set your sys prefs drivers to sound flower then use the program soundflower bed to monitor the sound. i use it all the time. i have some visualizers on my site as well. http://pixel8r.info my server is messed right now not sure why but if you get an error just refresh and you can download some thing i only have a few audio reactive pieces up cybero has all kinds of them on his site. Thanks guys for the help. Cybero i actually found your site a couple of times, really great stuff. I didn't think to use the tutorial because it was using quartz builder. I dont have or know how to use Quartz Builder so i just skipped over it. But once you brought it up and i actually paid attention it was very helpful. I was able to use a similar setup to make some sort of visualizer using my own audio instead of the itunes protocol. My comp patches include Audio Tools v.08, Vade v002 movie player, and the custom patch called "Audio Spectrum" from the music visualizer template. I've also attached a screenshot of my working comp. So i notice that when using the kineme audio file input patch. It will only send the Waveform structure once. Meaning the song will play and the data is showing up and cycling thru. But once the song is over it'll stop the structure on the waveform output. This is also true for the other 3 outputs. Why is that? I was hoping to have my audio track loop and have the animation loop too. But all i have is a song that loops and the animation only goes once. Is there a way to work around this? I thought maybe if you put a new path into the input path of the audio file patch it would work. So i hooked up a string multiplexer to the path input. The SM had two different paths to use two different songs. Once SongA was over SongB would start and ideally the animation would continue. But that failed and i even tried changing the timebase to local and still nothing! Any solutions? Yes, Danny_J, solutions there are, but I'm just off out to set up a spanking gorgeous Yamaha - sweet key weighted, wooden cased midi piano sequencer - more later. Definitely Leo based aren't you, as evidenced from the png, what about setting a conditional value system to say when one track stops, the other starts, facilitated through a time conditional loop. You might well do with disabling one copy of your chosen viz and then start the next viz. I'm sorry but I'm not quite following. I feel like i already have a conditional setup, so when you get a chance please elaborate. I have the string multiplexer running to v002 movie player and audio file input patch. Using the movie player i took the current time and movie duration outputs and hooked it to a conditional. When current movie time is equal to movie duration by 0.1 tolerance. Then send signal to counter where the count output is hooked to two boolean multiplexers and my one and only string multiplexer. As well as a 2nd conditional patch that just resets the counter. The boolean multiplexer have two source input where one is true and one is false. Both are opposite from each patch. The output for both are hooked up to there own audio file player. Which is how I'm able to switch and trigger between the two audio tracks. 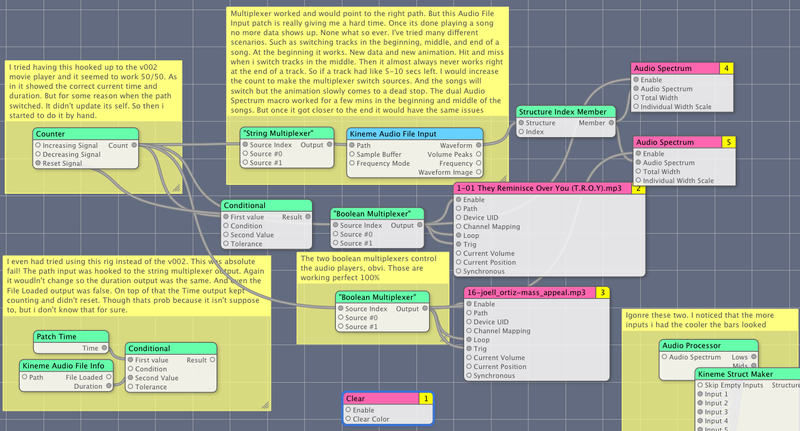 Like i stated the counter is also hooked up to the string multiplexer to switch between the audio track source path. Everything works because both songs play and switch when there suppose to. But i still don't understand the animation part. Should i just duplicate the audio file input patch and everything that is connected to it downstream? Then just switch the enable on and off on the audio spectrum macro? Danny_J, I understand you confusion, will get back to you on this, however, I am very busy right now. I will need in any case to re-install Leopard for my own particular purposes, then that will give me a chance , in due course, to mock up a solution / demo for you. As it happens, my QC 4 is just failing to work without fail for me right now with Audio Tools. If anyone else wants to step into the breach, by all means please do so. Thanks i appreciate very much!! QC4? As in the new Quartz for Snow leopard? How is that without going into full detail? At my work we just put in a micro order for two family packs and some more RAM. I'm very excited and can't wait for it to get here!! Any work dependent upon patches or plugins not updated by the 3rd party manufacturer concerned needs a Leo only environment left available. Disk partitioning, Time Machine, all are useful in that regard. Shed loads of new features at almost every level of the OS, multi core processing OpenCL, etc. Last line on this before I get Leo reinstalled. The animation macro patch you could duplicate and render one with file one, file one ends, animation patch one switched to false enable, then enable audio file two & animation patch two- possibly a duplicate of the first animation patch - could be a new bespoke visualization.